Before you can analyze or share your maps in ArcGIS Pro, you need to create them from spatial datasets you either found online or created yourself. Taking the time to properly organize your data, get it down to a manageable size, symbolize it, and optimize its attribute table is an important habit to get into. Doing so will save you time and effort when performing more in-depth analysis, exploration, editing, or visualization. In this tutorial, you'll organize data downloaded from a government geospatial portal and create a map. You'll symbolize the data, create bookmarks to denote points of interest, and change the projection to optimize it for future web sharing. Afterward, you can continue to the Share a web map tutorial to learn how to share this map online. Mangroves are a unique and valuable type of coastal swamp ecosystem characterized by trees of the same name. They occur along tropical coasts worldwide and are a focus of both conservation and ecotourism efforts. 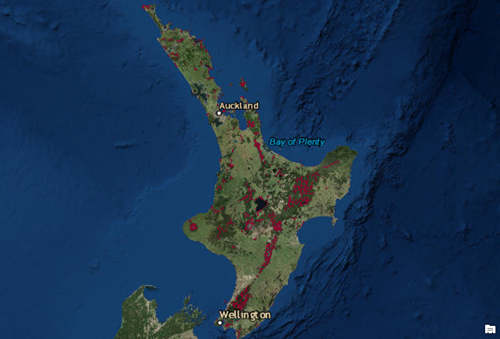 You'll create a map of New Zealand mangroves and nearby trails that access them using publicly available data downloaded from New Zealand government agencies. Finding and downloading data from geospatial portals is an important part of the map authoring process. 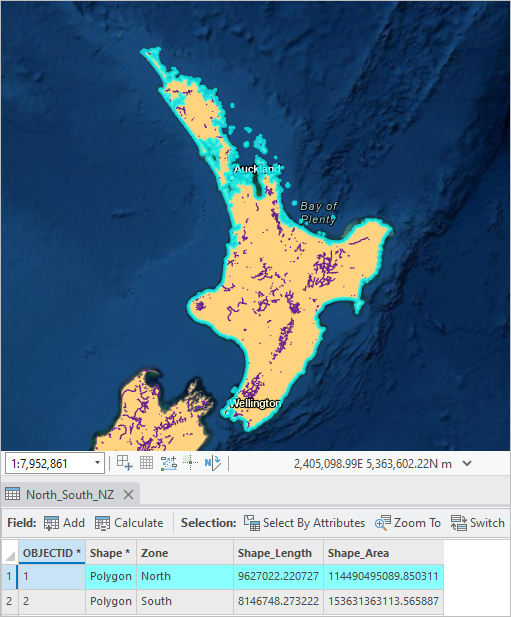 Although the data is provided to you in this tutorial, you can browse New Zealand's LINZ data service and the koordinates spatial data portal to practice browsing for data. You can search for the data used in this tutorial or browse for data that is interesting to you. Go to the Author a map overview page on ArcGIS Online. In the Downloads folder on your computer, right-click Author_a_map.zip and extract it to a convenient location. Depending on your needs, you can start an ArcGIS Pro project from a system template on the start page, or from a template you create. For this project, you'll use the Map system template, which starts the project with a map view. On the start page, click Map to start a project that opens with a default map. If you already have a project open, click the Project tab on the ribbon. In the list of tabs on the left, click New. Under Project Templates, click Map. On the Create a New Project dialog box, in the Name text box, type New Zealand Mangroves. By default, the project will be saved to the path shown in the Location box. If you want to save the project to a different location, click the Browse button and browse to the folder you want. The project opens with an active map view. Your default map extent or basemap may be different. On the ribbon, click the View tab. In the Windows group, click Reset Panes and click Reset Panes for Mapping (Default). To access the data you downloaded, you'll make a folder connection. In the Catalog pane, right-click Folders and click Add Folder Connection . On the Add Folder Connection dialog box, browse to the location where you extracted the Author_a_map.zip file. Click the folder to select it and click OK. In the Catalog pane, expand Folders and expand the Author_a_map folder. The Author_a_map folder contains another folder named nz-mangrove-polygons-topo-150k and a geodatabase named author_a_map_NZ. Datasets downloaded from online sources sometimes have long, descriptive names—especially if they belong to a large data collection. In this case, the nz-mangrove-polygons-topo-150k folder describes the location, theme, geometry type, and scale of the data it contains. You'll change the name later to something more concise. It contains a polyline feature class named DOC_Tracks and a polygon feature class named North_South_NZ. Right-click DOC_Tracks and click Add To Current Map . Here and elsewhere, your default layer symbology may be different. 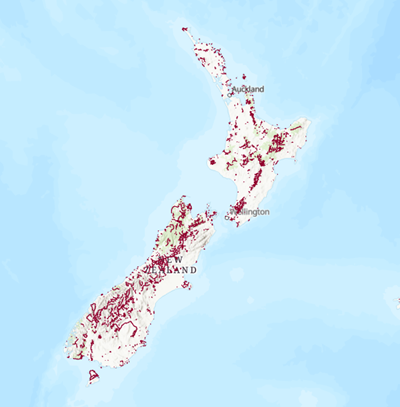 The map redraws to show New Zealand with the nationwide trail network managed by the New Zealand Department of Conservation (DOC). 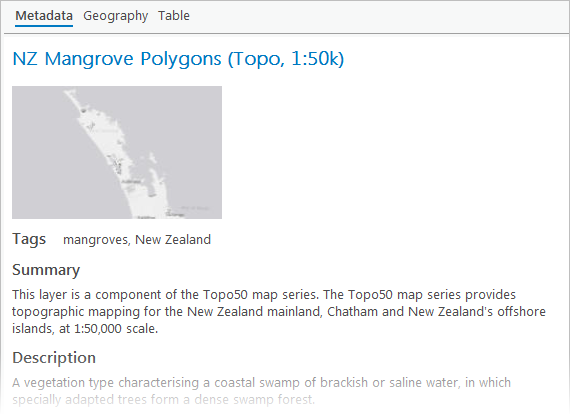 In the Catalog pane, expand the nz-mangrove-polygons-topo-150k folder. The folder contains a polygon shapefile , a text file , and an XML file that contain metadata. Drag the shapefile from the Catalog pane onto the map. A layer is added to the Contents pane. 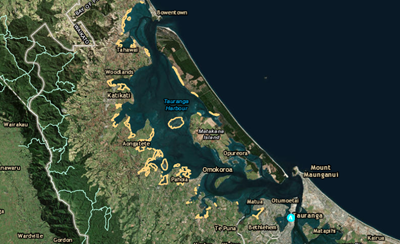 In the Contents pane, right-click the nz-mangrove-polygons-topo-150k layer and click Zoom To Layer . The mangrove polygons are small and may be hard to see on the map. On the ribbon, click the Map tab. In the Navigate group, click the Fixed Zoom In button several times and pan the map as needed until you see mangrove features. It's important to make sure the data you've acquired matches features on the ground, so you'll use satellite imagery to look a little closer. On the Map tab, in the Layer group, click Basemap and click Imagery with Labels. On the Map tab, in the Navigate group, make sure the Explore tool is selected. Zoom in close to an area of mangroves. In the Contents pane, turn the nz-mangrove-polygons-topo-150k layer off and on. The layer lines up well with areas of dark-green vegetation along coastlines and in shallow water. You'll view the metadata to become more familiar with the data. In the Catalog pane (not the Contents pane), right-click the nz-mangrove-polygons-topo-150k shapefile and click View Metadata . The catalog view appears. The left side of the catalog view shows the items in the nz-mangrove-polygons-topo-150k folder. The shapefile is selected. On the right, the details pane shows metadata for the selected item. If the details panel isn't showing, click the View tab on the ribbon. In the Options group, check the Show Details Panel box. The data was created at a scale of 1:50,000 (Summary field). The coordinate system is New Zealand Transverse Mercator, a national standard (Description field). The data is current as of May 2018 (Description field). The data source is Land Information New Zealand, the official New Zealand government agency for geographic information (Credits field). The data is suitable for display at map scales between 1:5,000 and 1:150,000,000 (Scale Range field). When you're finished, make the map active by clicking its view tab. Now that you're satisfied with the downloaded data, you'll move it to the project geodatabase to keep all your project data organized in one location. In the Catalog pane expand Databases . 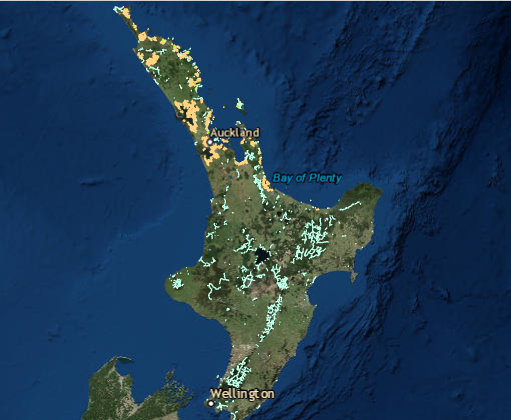 New_Zealand_Mangroves.gdb is the project's default geodatabase . This is where geoprocessing outputs will be saved, and where you'll store all data used in the map. In the Contents pane, right-click the nz-mangrove-polygons-topo-150k layer and click Data > Export Features . The Geoprocessing pane appears and opens the Copy Features tool. In the Output Feature Class text box, delete the entire default path and type Mangroves. ArcGIS Pro restores the path to the project geodatabase. If you hover over the Output Feature Class parameter, a ScreenTip confirms this. The new Mangroves feature class is added to the project geodatabase and a corresponding layer is added to the map. 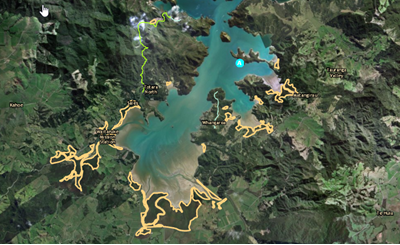 In the Contents pane, right-click the nz-mangrove-polygons-topo-150k layer and click Remove . The original data is preserved in the Author_a_map folder and can be accessed again if needed. Since the mangroves are only in the far north of New Zealand, trails on the South Island aren't relevant to your map. You'll create a feature class of trails on the North Island to use instead of the DOC_Tracks feature class. Then, you'll examine and modify the attribute table of your new feature class. 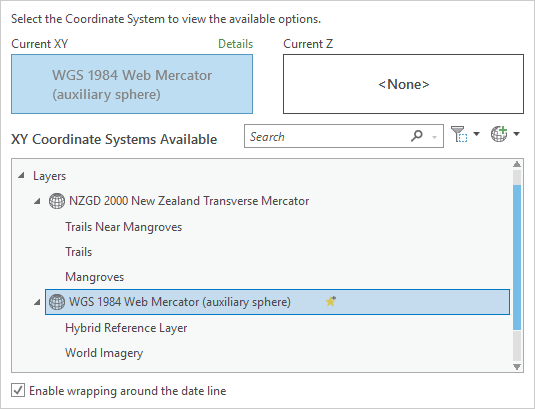 In the Catalog pane, under Folders > Author_a_map, expand the author_a_map_NZ geodatabase. Drag the North_South_NZ feature class to the Contents pane just above the World Imagery basemap. The North_South_NZ feature class doesn't reflect administrative divisions of New Zealand. It simply divides the country into two features centered around the two largest islands. In the Contents pane, right-click the North_South_NZ layer and click Zoom to Layer . All of New Zealand is displayed. Zoom in and pan as needed so that the North Island is centered in the map view. In the Contents pane, right-click the selected layer and click Attribute Table . Select the record for North by clicking the small gray square at the left edge of the first row. The record is highlighted in the table and the North Island is selected on the map. The Select Layer by Location tool opens in the Geoprocessing pane. Set Input Features to DOC_Tracks. Keep Relationship set to its default value of Intersect. Set Selecting Features to North_South_NZ. 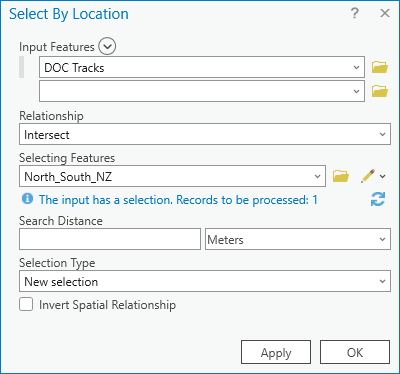 Trails that intersect the selected feature of the North_South_NZ layer will be selected. The trails in northern New Zealand are selected. You should see 1,459 selected features in the lower right corner of the map view. 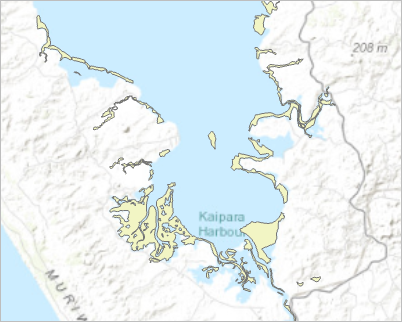 (This includes the selected feature in the North_South_NZ layer.) You'll copy the selected trails to a new feature class. In the Contents pane, right-click DOC Tracks and click Data > Export Features . The Copy Features geoprocessing tool opens. The Input Features parameter is set to DOC Tracks. In the Output Feature Class text box, delete the path and type Trails. The new Trails feature class is added to the project geodatabase and a layer is added to the map. On the Map tab, in the Selection group, click Clear . In the Contents pane, click the DOC Tracks layer to select it. Press Ctrl and click the North_South_NZ layer to select it as well. Right-click either selected layer and click Remove . The layers are removed from the map and the attribute table closes. Datasets may contain information you don't need for a particular project. Superfluous data can lead to large file sizes or distract you from the task at hand. In this section, you'll edit the Trails attribute table to remove attributes you don't need. The complete dataset is still preserved in the DOC_Tracks table. In the Contents pane, right-click the Trails layer and click Attribute Table . The attribute table contains seven fields. The STLength and SHAPE_Length fields have identical values, but while STLength was part of the original DOC_Tracks dataset, the SHAPE_Length field was added when you saved the Trails feature class to the project geodatabase. At this point, you can delete the STLength field. In the attribute table, right-click the STLength field name and click Delete . On the Delete Field prompt, click Yes. You don't need the CAPTURE_ACCURACY field in this project either. You could delete it, but you'll hide it instead. In the attribute table, right-click the CAPTURE_ACCURACY field name and click Hide Field . The field no longer displays but still belongs to the table and can be restored if needed. Finally, you'll assign an alias to the OBJECT_TYPE_DESCRIPTION field to give it a more concise display name. In the Contents pane, right-click the Trails layer and click Design > Fields . The Fields view of the table opens. On the ribbon, the contextual Fields tab appears. In the Fields view, note that the CAPTURE_ACCURACY field is present, but its visibility property is turned off. In the Alias column, click the value OBJECT_TYPE_DESCRIPTION to select it. Click the value again to make it editable. Change the alias to Description and press Enter. Close the Fields: Trails view. In the Trails attribute table, confirm that the Description alias appears. If necessary, click the Refresh table button at the bottom of the table view. On the Quick Access Toolbar, click Save . You previously created a smaller Trails feature class from a subset of the original features. Now, you'll use another location query to select trails that are within viewing distance of mangroves. You'll keep the existing Trails layer in the map for context. After selecting trails near mangroves, you'll export the selected features. Although you can make a map layer from selected features without creating a new dataset, these selection layers are not supported in ArcGIS Online. Because you intend to share the map as a web map, you'll make a new feature class. On the Map tab, in the Selection group, click Select By Location . At the bottom of the map view, note that nine trails are selected. In the Contents pane, right-click the Trails layer and click Data > Export Features . The Copy Features geoprocessing tool opens. The Input Features parameter is correctly set to Trails. In the Output Feature Class text box, delete the path and type Trails_Near_Mangroves. A new feature class is added to the project geodatabase and a layer is added to the map. In the Contents pane, uncheck the box to turn off the Trails layer. Right-click the Trails_Near_Mangroves layer and click Zoom To Layer . The trails in the new layer are small and difficult to see. 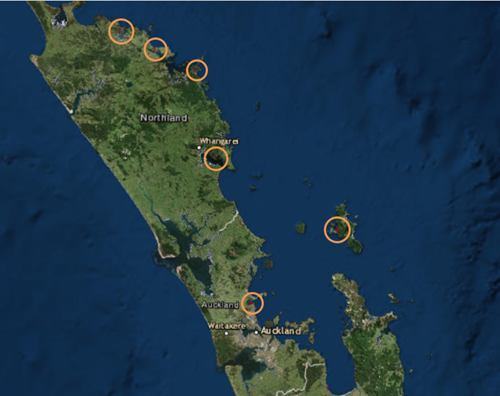 Orange circles indicate locations of some of the trails near mangroves. The circles are not present on your map. Use the Explore tool to zoom in on some of the trails near mangroves. Turn the Trails layer on again. If necessary, click the Trails_Near_Mangroves layer to select it. Click it again to make the layer name editable. Replace the underscores with spaces, so that it reads Trails Near Mangroves. Press Enter. It's important to know your map's projection and the coordinate system of each dataset you download. A map's projection can impact analysis and visualization, and choosing the right projection for a given map depends on its location, extent, and purpose. Earlier, you found coordinate system information in the metadata for a dataset; in a map, you can also find this information in the map properties or layer properties. After reviewing the coordinate systems of your map layers, you'll change the map projection and set the map extent. In the Contents pane, above the list of layers, right-click Map and click Properties . The Map Properties dialog box opens. In the list of tabs on the left, click Coordinate Systems. In the Current XY box, the map is currently projected to the New Zealand Transverse Mercator system. By default, ArcGIS Pro uses the coordinate system of the first operational layer (nonbasemap layer) added to the map; however, you can change this. 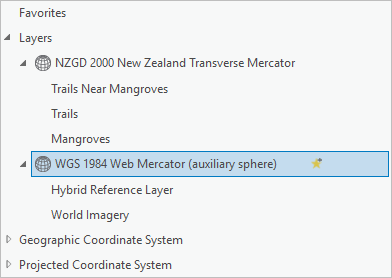 In the list of XY Coordinate Systems Available, under Layers, expand WGS 1984 Web Mercator Auxiliary Sphere. If necessary, also expand NZGD 2000 New Zealand Transverse Mercator. Resize the Map Properties dialog box by dragging its sides or corners. Two layers in the map—the basemap and its reference layer of place names—are in the Web Mercator coordinate system. Three layers—those you added and processed yourself—are in the New Zealand Transverse Mercator system. When map layers are in different coordinate systems, ArcGIS Pro projects them on the fly, as needed, to the same system. 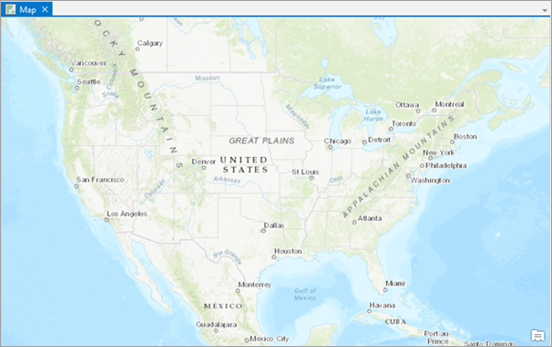 Your eventual goal, which you'll accomplish in the Share a web map tutorial, is to share your map to ArcGIS Online, which uses the Web Mercator coordinate system as its standard. At the bottom of the dialog box, check the Enable wrapping around the date line box. This option is helpful because the Web Mercator projection ends at the international date line, just east of New Zealand. You'll also limit the full extent of the map to the area of interest. In the list of tabs on the left, click Extent. Click the option to Use a custom extent. Under Extent of a layer, hover over Trails and click the All features button . The Selected extent boxes on the right update to reflect your selection. On the Map tab, in the Navigate group, click the Full Extent button . The map zooms to the North Island of New Zealand. This is the new full extent of your map. The date line wrapping and extent settings you made are useful for map navigation in ArcGIS Pro. When you share the map to ArcGIS Online, the date line setting is irrelevant because continuous map scrolling is enabled by default. Your custom full extent setting will be disregarded. The mangrove features are hard to see because of their size. In addition, the symbols assigned to your map layers are random and may not be satisfactory. You'll change the symbology for all three map layers. 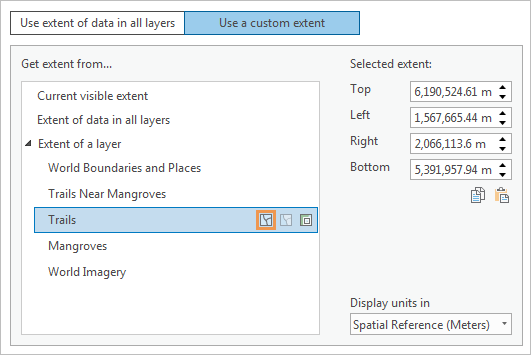 In the Contents pane, right-click the Mangroves layer and click Symbology . The Symbology pane appears and displays symbology properties for the Mangroves layer. Under Appearance, set Color to No color. Set Outline color to a light orange such as Mango and set Outline width to 2 pt. Click Apply. The mangroves are now easy to see, even at the full extent of the map. In the Contents pane, click the symbol for the Trails layer. The Symbology pane updates to show symbol formatting properties for the Trails layer. At the top of the pane, the Properties tab should still be selected. In the Symbology pane, change Color to a pale aqua color such as Indicolite Green. Make sure Line width is 1 pt and click Apply. In the Contents pane, click the symbol for the Trails Near Mangroves layer. In the Symbology pane, change Color to Peridot Green or another bright green color and click Apply. The trails within viewing distance of mangroves are concentrated in a few areas. You'll add bookmarks to help map users navigate to important locations. In the Locate pane, in the search box, type Okura Bush Scenic Reserve and press Enter. The map zooms in to the location and a temporary marker is added. 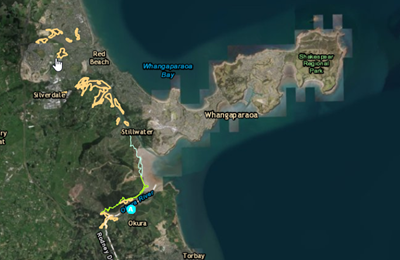 Zoom out and pan to a map extent that shows all the mangroves and nearby trails in the area. Use the image below as a guide. If you don't have access to the ArcGIS World Geocoding Service, you can find the area by its coordinates. On the Map tab, in the Navigate group, click Go To XY . In the overlay that appears on the map, set the location unit format to Meter (m). For the X value, type 19450000; for the Y value type -4390000. Press Enter. To remove the overlay from the map, click the Go To XY tool to deselect it. On the Map tab, in the Navigate group, click Bookmarks and click New Bookmark . In the Create Bookmark dialog box, change the Name to Okura Scenic Reserve and click OK.
You'll repeat the process to add two more bookmarks. In the Locate pane, in the search box, clear the current search term and type Tauranga, NZL. In the drop-down list of suggestions, click the first suggestion (it matches your search term). Pan and zoom the map as needed to show all of the harbor, using the image below as a guide. If you're using the Go To XY tool, go to X: 19600000 and Y: -4520000 m. For the next bookmark (Matangirau, Auckland), use X: 19340000 and Y: -4170000 m.
Bookmark this location with the name Tauranga Harbor. Locate Matangirau, Auckland. Zoom out to view the mangroves surrounding the large bay. Bookmark this location with the name Waitaruke. On the Map tab, click Bookmarks . Zoom to each of the three bookmarks in turn by clicking their thumbnail images. In the Navigate group, click the Full Extent button . In this tutorial, you learned the key pieces of authoring a map: making folder connections to data; exploring, organizing, and processing data; and symbolizing your map. You designed this map with the intention of sharing it to your ArcGIS organization; go to the Share a web map tutorial to learn how to do that.